Roger Bisby checks out the Ronseal Trade range. I have seen a lot of exterior varnishing jobs over the years, normally with what they call yacht varnish and, if I had a yacht, I wouldn’t touch yacht varnish with a boat hook. Ronseal’s Crystal Clear Exterior Varnish is designed to overcome those problems of yellowing and cracking and splitting that seem to plague the conventional oil-based stuff. This varnish is milky white when you put it on but it dries clear. This is very useful because you need three coats so being able to see the new coat coverage is important. The instructions say you should leave six hours in between but is that a minimum of six hours or do you have to hit it with the next coat before it goes off? On the final coat you need to sand it lightly with 240 grit abrasive and give it a wipe down to remove the dust. Life is getting very confusing these days because this product contains organic solvents (VOCs) but you need a synthetic brush and you can wash it out in warm soapy water. Ronseal also has an interior version of this product. 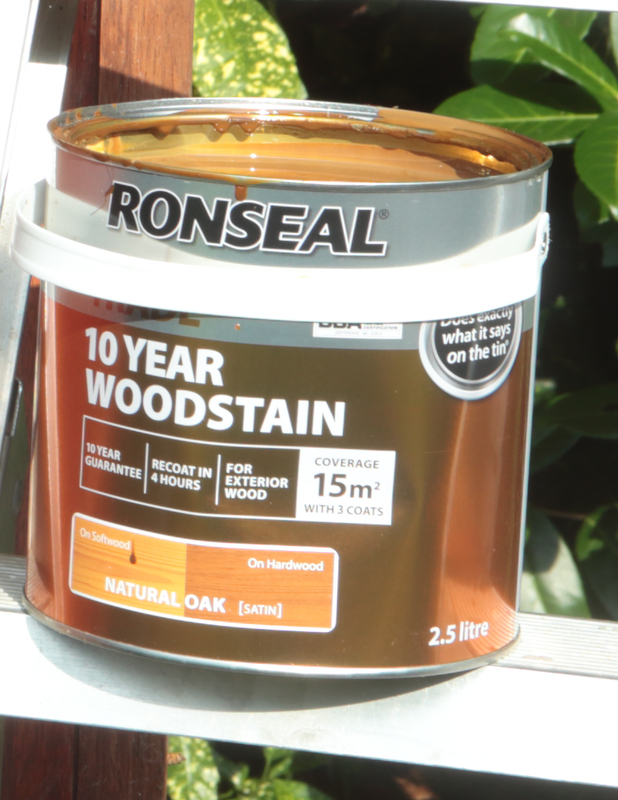 This woodstain can be used on exterior joinery and is said to resist peeling and cracking. For me the deal clincher is the fact that it doesn’t need a base coat or primer and it is dry in one hour. Ronseal offers a 10-year guarantee on this product but I am not certain what conditions apply. It can’t be that this product will sit happily on a ropey old softwood window frame for ten years, so they must be assuming that there is no sign of decay in the timber. Personally, I think that a lot of softwood frames reached an all-time low about ten years ago and since then a combination of slower grown timber and factory-applied paint finishes has helped rescue timber joinery. Ronseal coined the phrase “does exactly what it says on the tin” and if it is true of this product it will fly off the shelves. Unfortunately the only way I can verify that is to put it on and wait ten years. A few years ago if you were looking for a tough, let alone an ultra-tough, floor varnish it would have to be a two pack epoxy product. The idea that a quick drying water based product would do the trick was unthinkable but time and technology moves on and things that were impossible yesterday have become possible today. I have not had a chance to test just how tough this finish is but as an accelerated test I painted some off cuts and tried some abrasion tests plus a bit of dancing in my stilettos. If that image is a little uncomfortable for you then let me tell you now that they weren’t actually my stilettoes. I borrowed them from my builder mate Francis. The product seems to hold up fairly well and, given that it is so quick and easy to apply even if it is merely tough and not ultra-tough it is still better than all that two pack palaver with the nasty fumes.